Everyone tends to think a little bit more about the Christmas story the closer they get to December. However, there is so much to learn from the story any time of the year. The entire story is incredible. We see angels heralding heavenly messages to men below. We read of wealthy wise men and their elaborate gifts as they “follow yonder star.” Humble shepherds appear, excited to behold the promised Child. All these facts are marvelous to read about, but do we ever consider Mary? At such a time, girls were married very young – around 14 or 15 years old. They were considered women by that age, and held far more responsibilities than the young females of today. They washed clothes by hand, mended garments, watched the younger siblings, and assisted with the livestock and gardens. Mary would have done all these things, yet she was also engaged. With all these tasks already on her plate, Mary had her hands full without a supernatural pregnancy to think about. Sometimes we think of Bible people as being extremely holy, non-emotional, and level-headed. However, they were people just like us! Mary was busy serving God as a dutiful young Jewish woman. She had her daily routine as many of us do. She wasn’t expecting a visit like this! Despite all the questions her finite mind might have come up with, her response came from a heart dedicated to God, “Then Mary said, ‘Behold the maidservant of the Lord! Let it be to me according to your word.’” (verse 38). By her reply, we know God has chosen accurately. He knew her heart and the willingness in it to do whatever He asked her to do. She, in turn, knew His heart, His ways, and His love – so obedience was a natural response. We’re grateful that Mary’s response was so faith-filled, but consider what might have happened if Mary had said, “There’s no way a woman could get pregnant like that – with the Son of God or otherwise! I just can’t believe it!” Would God’s plan to bring the Savior into the world be suddenly shut down? No, God’s plans don’t end because of someone’s unbelief. He’ll find someone else! Consider, though, how sad to it would be to forego being used in a supernatural event just because it seems so unthinkable. 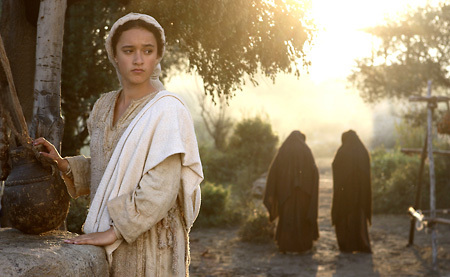 Mary was an “average” girl in the world’s point of view. What set her apart from the rest in God’s eyes was her virtuous, God-seeking heart. We don’t have to be born into a high-status family to be chosen by God. We don’t have to be “up front,” known by more than just the handful of people in our tiny town. There’s no rule that says we have to be multi-talented and witty. The only ingredient needed is faith and willingness. Together, they open the door to the supernatural working of God – an incredible plan that only He can think up.